A modern restaurant with a decidedly mystical Middle Eastern atmosphere. Let yourself fall on the stylish lounge sofas and enjoy all the scents and flavors. Leeuwarden Lounge gives you a special evening with heavenly tapas. Finish the evening with a fresh tea or a glass of wine. There is also a choice of shisha and a wide range of special flavors. That is the best way to end an Middle Eastern evening! Fantastic food! Beautifully presented and we love the friendly service. We will definitely be back. Nothimg like it in Leeuwarden! We chose this restaurant as it came forward as one of the better places for food in Leeuwarden, and we both were pretty excited to try this place. We made reservations at 8:30 but came in a bit early. The restaurant appeared empty and we were seated on a 2 person table next to the toilet entrance. The girl helping out was so uncomfortable talking English to my girlfriend she just did everything in Dutch in the hope I’d translate, and was not even trying in the slightest part with any English. It was odd to us, as she greeted us in English so it was obvious she did know some of the language. This made us feel a bit unwelcome and made my girlfriend uncomfortable at times. The food itself was decently done, but could have been of better value for the money. Most of it was quite salty and the meat selection was not always seasoned well. I personally like the take on middle eastern tappa’s tho, and was pleasantly surprised with some of the dishes. However, I think the overal quality could have been better. Muffe ruimte. Kleine porties. Veel geitenkaas en veel brood, maar weinig goed eten. Daarna nog naar pizzeria geweest. 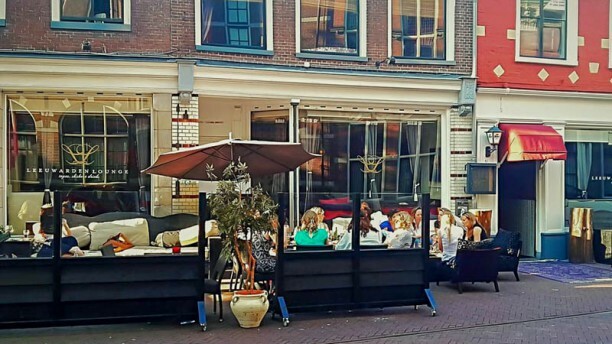 Bediening zonder horeca ervaring.